Your search for the most simple to use, yet powerful Time and Attendance system ends here. TimeForce offers a 100% browser-based program for the small to mid-sized business that improves productivity and profits. It is the software solution to automate 100% of your pay rules and calculate gross payroll, even in the most complex environments. 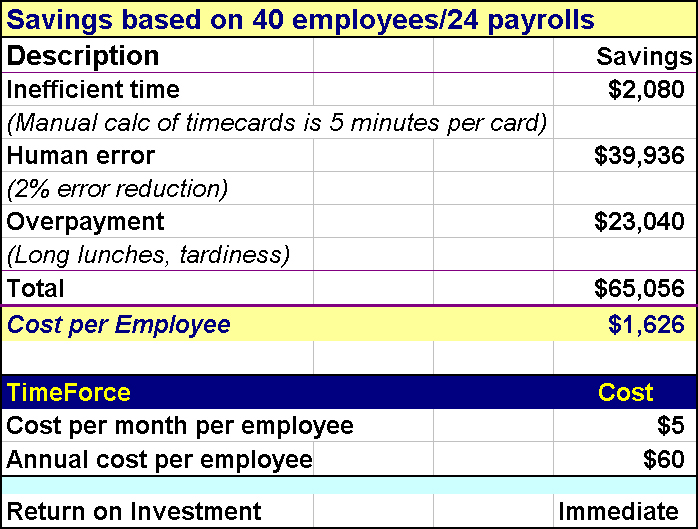 TimeForce is effective for both hourly and salaried personnel. Employees clock-in using a PDA, timeclock, biometrics device, or browser-based Self Service Module. The system ensures accurate rounding and calculation of grace periods, overtime, accruals, shift differentials, holiday pay, premium pay and more, all according to your company-defined pay rates and rules. Copyright © Advanced Database Designs .1999-2004 -- all rights reserved. This page last updated: March 1, 2004.